Background: Expression of human epidermal growth factor receptor type 2 (HER2) in head and neck squamous cell carcinoma (HNSCC) cell line HN5 can be employed with great opportunities of success for specific targeting of anti-cancer chemotherapeutic agents. Objective: In the current study, HER2-specific affibody molecule, ZHER2:342 (an engineered protein with great affinity for HER2 receptors) was selected for conjugation to idarubicin (an anti-neoplastic antibiotic). Method: ZHER2:342 affibody gene with one added cysteine code at the its 5′ end was synthesized de novo and then inserted into pET302 plasmid and transferred to E. Coli BL21 hosting system. After induction of protein expression, the recombinant ZHER2 affibody molecules were purified using Ni- NTA resin and purity was analyzed through SDS-PAGE. Affinity-purified affibody molecules were conjugated to idarubicin through a heterobifunctional crosslinker, sulfosuccinimidyl 4-(Nmaleimidomethyl) cyclohexane-1-carboxylate (Sulfo-SMCC). 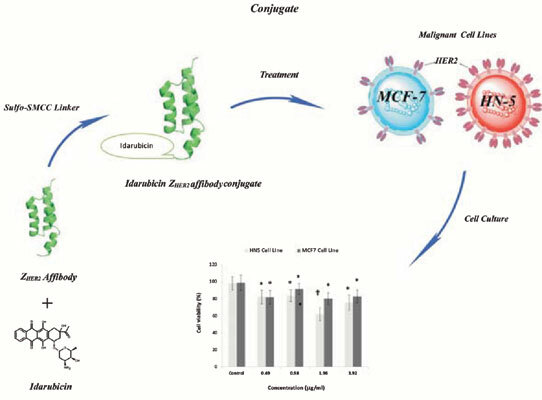 Specific toxicity of idarubicin-ZHER2 affibody conjugate against two HER2-positive cells, HN5 and MCF-7 was assessed through MTT assay after an exposure time of 48 hours with different concentrations of conjugate. Results: Idarubicin in the non-conjugated form showed potent toxic effects against both cell lines, while HN5 cells were significantly more sensitive compared to MCF-7 cells. Dimeric ZHER2 affibody showed a mild decreasing effect on growth of both HN5 and MCF-7 cells at optimum concentration. Idarubicin-ZHER2 affibody conjugate at an optimum concentration reduced viability of HN5 cell line more efficiently compared to MCF-7 cell line. Conclusion: In conclusion, idarubicin-ZHER2 affibody conjugate in optimum concentrations can be used for specific targeting and killing of HN5 cells. Head and neck cancer, HN5 cell, HER2 receptor, specific targeting, idarubicin-ZHER2 affibody conjugate.